The owners of Action Immigration Bonds, Robert and Judy Prager, have recently discovered the ongoing embezzlement scheme by former employees Alonso Escobar, and Jeremy and Margie Wolf who left Action to form US Immigration Bonds. At Action we consider honesty and integrity the most important components of any business particularly in the immigration bond business where trust is paramount. The article below is originally from the Daily Business Review a newspaper focusing on legal and business matters in South Florida, and reported by Samantha Joseph. Received 5/20/16 – Private investigator Robert Crispin seized $48,385 in cash from Alonso Escobar, accused of participating in a $2 million fraud. Three Fort Lauderdale bail bondsmen needed to post their own bail after their arrests on fraud and embezzlement charges. 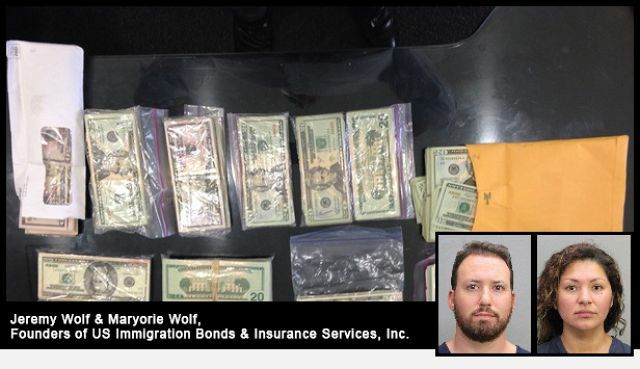 Jeremy Wolf, his wife Maryorie Melgarejo and her brother-in-law, Alonso Alexander Escobar, are accused of embezzling up to $2 million from a former employer in a case involving a duffle bag stuffed with cash. The trio worked for Action Immigration Bonds and Insurance Services Inc., a family-run Fort Lauderdale bail bond business serving immigrants arrested in the U.S. A criminal complaint brought by the Florida Department of Financial Services claims a long-term con left a paper trail documenting hundreds of thousands of dollars siphoned from corporate accounts. Company owners Robert and Judy Prager say it was a small portion of a larger scam that skimmed millions in revenue. The Pragers were semi-retired and had gradually turned over control of the company to the Wolfs. “The theft is devastating both financially and emotionally to the entire family,” Judy Prager said. Jeremy Wolf is Judy Prager’s nephew and worked at the company since 2000. His wife was also a long-term employee. The couple hired several of Melgarejo’s relatives, including Escobar and his spouse, Jessica. The Pragers expected to sell the company to the Wolfs and said they had given their nephew 10 percent of the business, but the turnover plan fell apart in a disagreement over the transfer timeline. The Wolfs left the company in February 2014 to launch their own immigration bond business. Judy Prager said she first became suspicious when business dried up from multiple long-term referral sources after the Wolfs launched their competing business. Several of Melgarejo’s relatives stayed at Action Immigration Bonds, and the Pragers suspected they were diverting business to the new competitor. A closer look at company records uncovered the long-term fraud, according to arrest records. An affidavit from forensic accountant Lynn Britt of Britt & Co. tracked more than $625,000 in money stolen from 2010 to 2014. Britt said employees falsified payroll records to increase bonuses and wrote company checks payable to accounts in fake names. Britt claimed the three defendants diverted revenue using several schemes, including swiping cash, changing the payee name on checks and instructing customers to pay with blank money orders and stealing those funds. Private investigator Robert Crispin of Crispin Special Investigations Inc. in Fort Lauderdale referred the findings to investigators. He said Escobar confessed, implicated the Wolfs and turned over a duffle bag with $48,385 stashed at his home in Sunrise. Escobar, 35, was arrested June 1, 2015, on a second-degree felony charge. He was charged with scheme to defraud in a case pending before Broward Circuit Judge Matthew Destry. The Wolfs were arrested May 9 on money laundering and grand theft charges and were released on $350,000 bail each issued by Braswell Bail Bonds of Stuart. They are set for arraignment before Broward Circuit Judge Dennis Bailey.